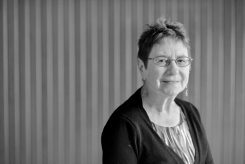 Maureen FitzGerald has been involved in the Sexual Diversity Studies Program since its inception and held the position of director of the undergraduate program from 2000-2006. As an alumna of the University of Toronto she helped form, activate and maintain the Rainbow Triangle Alumni Association from 1995–2000. As managing editor of Women’s Press in the 80’s, FitzGerald initiated and fought for the inclusion of lesbian-centred writing, both fiction and non-fiction there. More recent activities have been as co-curator with Don McLeod and Scott Rayter of the Queer Can Lit exhibition at the Fisher Rare Book Library, University of Toronto (2008) and as co-editor with Scott Rayter of Queerly Canadian: An Introductory Reader in Sexuality Studies (Canadian Scholars Press, Fall 2012).